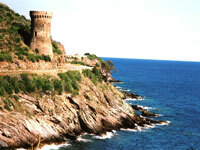 North of Bastia is the holiday destination of Cap Corse, a 25-mile (40km) peninsula edged with quaint fishing villages. The peninsula is divided by a narrow spine of mountains, which rise over 3,000 feet (914m) above sea level. On the east side of the Cap Corse mountain spine are a series of small villages cuddled into picturesque coves, while on the west coast the settlements cling precariously to rugged cliffs battered by wild waves. The peninsula's best stretch of sandy beach to enjoy on holiday is Plage de Tamarone, near Macinaggio. A favourite attraction with holiday visitors in Cap Corse is the charming village of Centuri; favourite activities include hiking and hikers flock to the area to enjoy the many walking trails, like the well-known Sentier des Douaniers. Make sure the camera is loaded for visits to the panoramic viewpoints of Capo Grosso, Moulin Mattei and the Tour de Seneque, above Pino. The vineyards of Patrimonio are renowned, particularly for their muscat, and most wineries welcome holiday visitors for wine tasting. The Cap Corse wine route, or 'route des vins', is signposted from St-Florent.